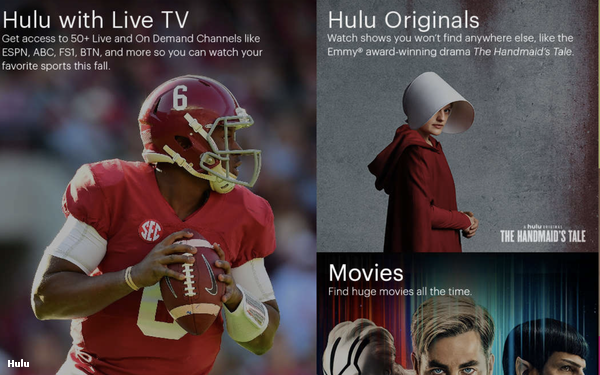 If you are a sports fan, prepare to become very familiar with a pair of streaming video bundles: Hulu and YouTube TV. Why? These two companies are ramping up their marketing spend in a big way this year, and both have built their strategy around live sports. Hulu this week announced that it would become the presenting sponsor of the Stanley Cup playoffs and final. Hulu also announced a deal with Turner Sports to become the presenting sponsor of TNT’s NBA playoffs coverage. Once you get to the NBA Finals, however, YouTube TV is the presenting sponsor, with a major brand presence during ABC’s coverage of the series. YouTube TV also signed a multiyear deal to become the presenting sponsor of the MLB World Series, building on a relationship that started last season. A year ago, there were no presenting sponsors for the NBA Finals, World Series or Stanley Cup final. Now they are all streaming services. The rationale for Hulu and YouTube TV is simple: sports remains a linchpin of the pay-TV bundle, and reaches a wider swath of people than any other programming. Many consumers may not even realize that services now exist that let them stream live sports. Hulu with Live TV and YouTube TV both fit that bill, and they want consumers to know that. The sponsorship deals mark an all-out assault on the market leaders on streaming bundles: Dish’s Sling TV and DirecTV Now, which have a few million subscribers combined, and an early lead in the market. Hulu and YouTube TV want their subscribers and potential subscribers, and they are turning to the biggest programming on TV to try and lure them away.